Abel Environmental specialises in heat pump applications for developers, national housebuilders and housing associations. We’ll ensure your scheme achieves the highest standards of energy efficiency and meets the latest renewable energy requirements. How heat is provided to community schemes has to change dramatically. Fuel security, rising fossil fuel prices, increasingly tough legislation and the need to combat climate change, are all driving the demand for greater efficiency and the inclusion of renewable energy. This is why many new build and major refurbishment projects throughout the UK must now demonstrate significant use of renewable energy or simply face planning refusal. To reduce reliance on fossil fuels and preserve our energy resources into the future, we must consider alternative heating solutions that harness renewable energy and subsequently reduce energy consumption, lower emissions and increase efficiency. In 2007, fuel use for space heating and hot water in the UK totalled 535TWh, with the residential sector accounting for an estimated 78%. It is clear that if the UK is to achieve the goals that have been set then these areas need urgent attention. Heat pumps are already recognised as a low carbon alternative to traditional systems such as direct electric, these type of systems being commonly found in high rise and multi dwelling buildings. The environmental impact of heat pump systems will also decrease as the electrical distribution grid becomes cleaner, and decarbonising the grid is of course a major part of the UK’s carbon reduction plan. Using advanced heat pumps specifically designed to deliver heat in the UK climate, Mitsubishi Electric meet these tougher energy challenges head on. For every 1kW of electricity consumed by one of their air source heat pump systems, 3.2kW of heat can be delivered, 69% of which is renewable energy. 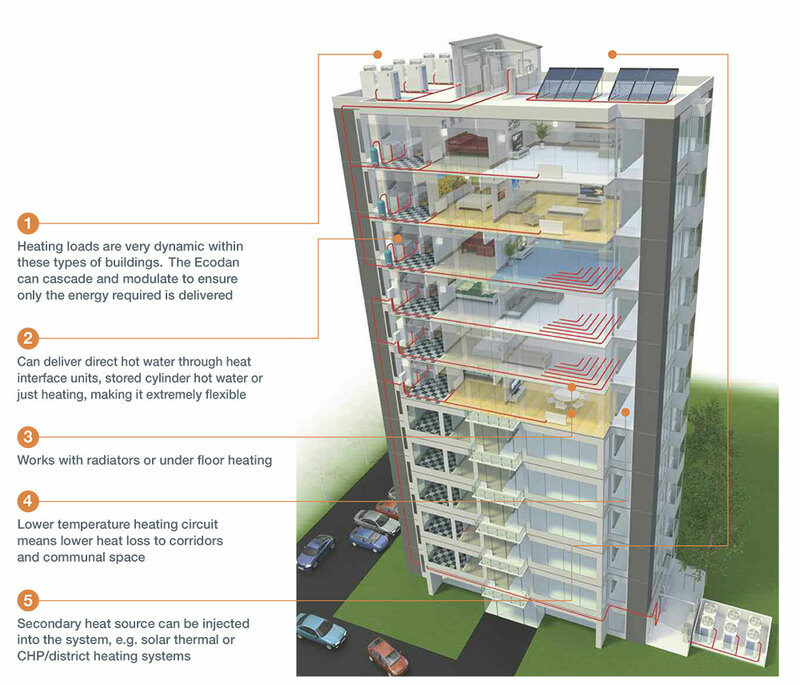 High rise buildings lend themselves well to centralised community heating systems; roof space and ground level areas offer the opportunity to locate the heat pumps without disturbing or giving up internal space. These systems are low maintenance and because they are a mechanical installation, fit into the normal regime and skills of local facilities management. Ecodan systems are modular, simple to design and their flexibility means if capital investment is limited, they could offer the whole or just part of the solution. Heat Interface Units (HIU) allow for a hydraulic break in the system giving the apartment/flat autonomy from the larger system. They offer simplicity to the installation and ensure each flat looks similar and is installed in the same way, making maintenance more predictable. The industry for HIU’s is well advanced with many different options available, including recessed units to avoid tampering, and from the users point of view they look and feel like a normal boiler. These units perform an important task in delivering the heating and hot water, plus also allowing each flat to control their own system, whilst feeding back usage information centrally for the purpose of billing. 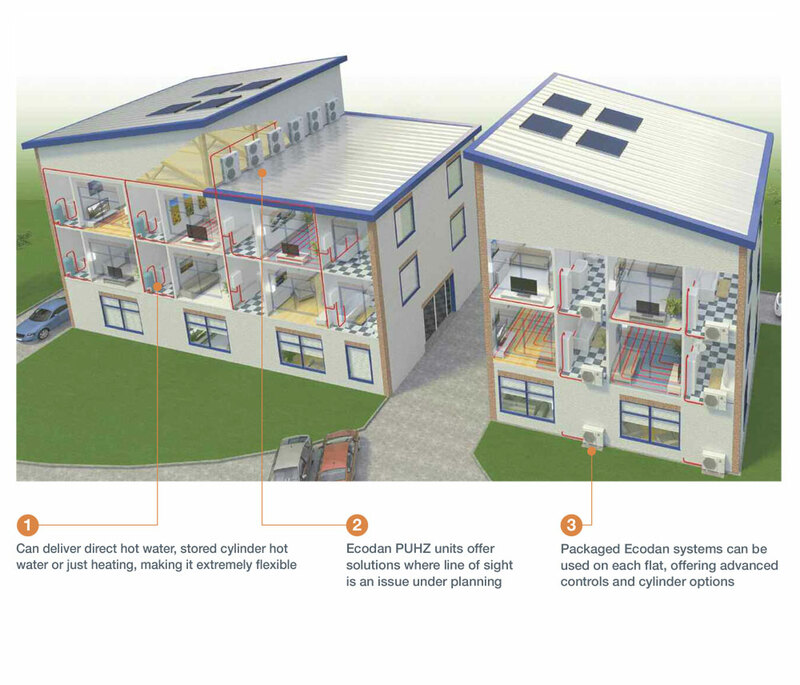 Low rise buildings allow for a wider range of solutions with both centralised and stand alone heat pump systems available to suit the style of building and space. Ecodan can either be used centrally or offer a full packaged cylinder and heat pump solution to each flat with Mitsubishi Electric’s simple to use but advanced controls. Ecodan systems are now a widely used and accepted technology, giving both the users and local authorities the opportunity to reduce running costs and decrease their carbon emissions. The drivers for replacing the heating systems in these types of buildings may be to reduce carbon and increase renewable credentials, but tenant satisfaction is always paramount. Removing heating systems like direct electric and storage heaters will significantly improve comfort levels and offer a level of control many will have craved. Many social housing tenants are on pre-paid meters which are on average 20% more expensive, but by moving to centralised plant means that the electricity consumed for heating will no longer be within the flat. This will provide instant savings through the bulk purchase of electricity across multiple flats, on top of the vastly increased savings due to the efficiency of an Ecodan heat pump. In order to ensure you get the maximum performance from your heat pump system throughout its working life, you need to arrange for the system to be regularly serviced and maintained. This is important not only to comply with our warranty conditions, but also to meet the demands of the Renewable Heat Incentive (RHI) scheme, with the minimum requirement of an annual service. AES has developed a range of service and maintenance plans to support heat pump heating systems and give our customers affordable peace of mind.